Pierate - Pie Reviews: Eric, I’m not Lyon about these top Birmingham Pies! Eric, I’m not Lyon about these top Birmingham Pies! I have to admit that handmade pies from local butchers have been a bit of a rarity on www.pierate.co.uk but not for want of trying. It's just there are so many other pies that leap out at you from a supermarket shelf that finding a local pie selling butcher can be a challenge. So when Roger, a friend of mine who lives in neighbouring Solihull, asked if I'd had an Eric Lyons I have to admit it drew a blank with me. 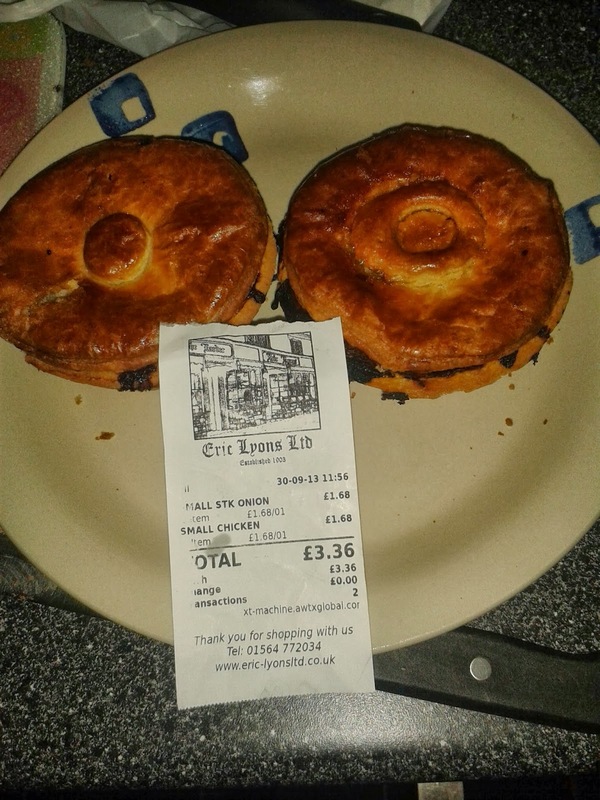 Turns out though that the local butcher on Knowle High Street sells a range of pies, which Roger has been commending for years without me realising! And he very kindly picked some up for me. So I give you the Eric Lyons Ltd Chicken and Steak & Onion pies, at a very precise £1.68 each (another sign of a local handmade delicacy). How though did they rate? Well it's clear to see that the colour of both pies were wonderfully golden! The capacity was strong in both pies and the pastry crisp and crunchy. There were no soggy bottoms here! The chicken pie had good meatilicous chunks of tender chicken in a light, not overly creamy sauce. 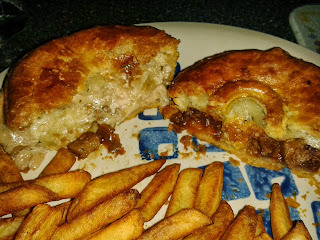 Unlike some chicken pies that get very stodgy quite quickly, this was a delight to eat from start to finish. The meat wasn't chewy and the chicken was quite consistently spread throughout the pie. (No padding out the filling with other things here!) Nothing overly exciting had been done with the flavour, which might disappoint some, but the meat itself was succulent and tasty enough in my opinion. So if you fancy a butchers at a homemade pie in the Solihull area, you can't go far wrong with Eric. And I'm not lyon about that either.